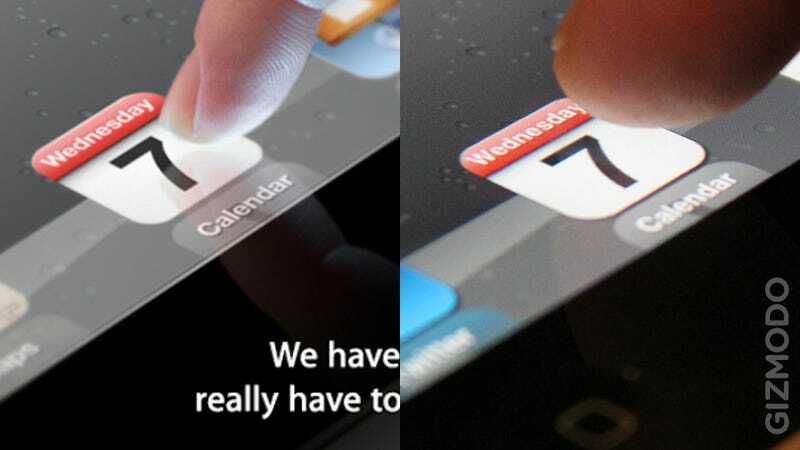 Apple just flashed their new iPad 3 on their Wednesday 7 event invite. You can clearly see the new Retina display in all its glory. Compare the left (invitation) to the right (the iPad 2). The top has a lot more definition. It's clear on the typography in the Wednesday, the spacing in relation to the icon and the edges of the icon itself. Not only that, but there seems to be NO home button, which explains the mention of the "And touch." in their invitation. How can we know? First, the photo they are showing is on portrait mode. You can't achieve that icon spacing in the landscape mode (which is the only explanation for the lack of home button). Moreover, the icon falls right onto the same water drop that the current iPad 2 falls while in portrait mode. The same happens with the reflection on the dock. And, on top of that, it's impossible to get the same icon spacing in landscape mode. Clearly, Apple's invitation is showing a photo of the iPad in portrait mode. And there's no button to be seen. Unless they turned it upside down, of course. By why would Apple do that? Perhaps to tease us, but it really doesn't make much sense. Or maybe the whole thing is a lie, lie, LIE! Remember, nothing is real until Apple unveils it. I have to confess that I like the idea of them keeping a physical home button—despite my iPhone 4's button failing more than I would like. But simple is beautiful, as Jobs and Ive would say. Additional reporting by Adrian Covert. Both icons zoomed. The difference is clear. Look the low pixel count on the Wednesday typography onthe right image. Also, look at the alignment and the quality of the edges and the background. Here you can see how the Calendar icons align on the same exact position in portrait mode, both for iPad 3 and iPad 2. On the iPad 3 shot there seems to be no home button. Here you can see a comparison between the invite (top) and the iPad 2 in landscape mode. The middle shows the Calendar icon near the center. The bottom one shows the Calendar icon closer to the right side. We tried to match the portrait iPad 2 and iPad 3, but we couldn't. The spacing is wrong no matter how many icons you put on the dock. The reflection intersect the icon's edge in the wrong place no matter where you position it.